Mama of 10 : Oh My, The Prom! My little babies all grown up! Anna and I found her dress at a cool, vintage thrift store on Franklin Street for $15. And it fit her perfectly! 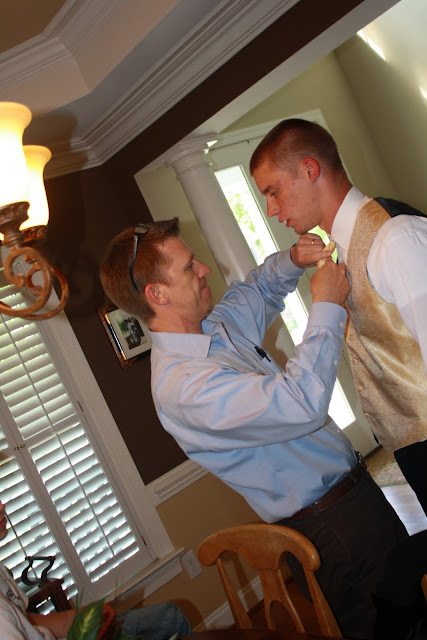 Thankfully Ron came home early from work to help Ben with his tux. I didn't know how to "fix" any of it! This is my favorite shot. Anna's friend was over getting ready with her and Ben was being so shy taking pictures. I can't believe how grown-up they are! It goes by so fast. Is it promtime already?! Wow. Your kids look great! I never went to my own prom but I hope that when my boys are that age they'll want to go. How fun is it to see your kids dressed up for a fun night?! By the way, that last picture is my favorite! It's the type of picture that catches my attention and says 'Hey. There's a story here.' The expression on each of their faces is great! WOW! I am so impressed with that $15 dress. She looks lovely in it! I meant , I'm looking forward to following your blog !! And by the way prom picture's are fabulous ! They all look fabulous ! !